Two and a half years ago, we took to the streets in hundreds of cities to protest the financial elite and their cronies in government. We created protest communities in public spaces, abolished debt, wrote the Volcker Rule for financial reform, and helped hurricane survivors rebuild. Now, we’re challenging our corrupt government directly by building political power, starting at the local level. The After Party isn’t a traditional political party in any sense. We organize by identifying and meeting a community’s needs from beyond the political system, and getting rid of corrupt politicians by getting our own community leaders into local office. We will feed the hungry, educate those who wish to learn, care for the sick, and house those whose homes have been taken. We will break the stranglehold of the broken two-party system by innovating and changing the rules of the game. 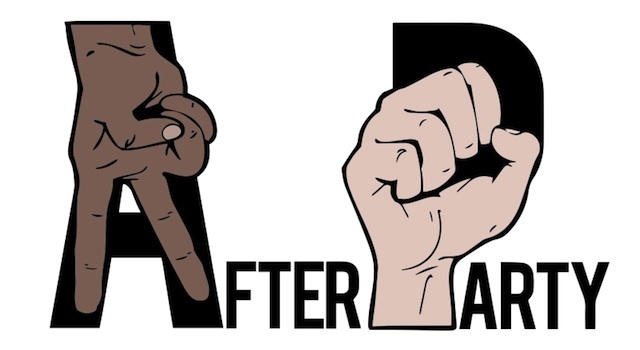 We’re counting on you to tell your friends about the After Party, and help us get the word out about the new political party that will finally speak for, and with, young people, the poor, people of color, the homeless, the hungry, and the uninsured -- the same people who have been left out of the conversation for too long. ‘Like’ and ‘Follow’ us on Facebook and Twitter to stay up-to-date on Party news! "Every human being is entitled to food, shelter, education, employment, and healthcare. Very nice. Amen to that. loved fdr. just loved him. a true American hero. Exactly, flip. No matter how anyone goes about reinstating the social contract, that is a very nice summary of the truths. The leaderless thing was a disaster (or a constructive failure, as people who participated say). Occupy's trying to evolve. So jart, do you actually identify with The 99% ?! Never mind the pretty colours here (btw, consider that 'orange on yellow and sky blue on white' is NOT enough contrast and is painful on the eyes, imho) & .. either you or Grim & White need to get a grip on this forum, imo !! Furthermore, Dr. Margaret Flowers' commitment to The 99% Struggle is NOT in question I suggest !!! Get over yourself sister, swallow your ego and .. you know - ''do no evil'' & ZD's comment has value too. It's interesting to read your assessments followed by all of the sighs of relief and cheering in these comments. I didn't read much of the after party myself, but this post is reminding me that anything can be made to look good; and what should normal people (who don't study these things and shouldn't have to) really believe? It's starting to make a whole lot of sense, that democracy alone doesn't amount to the truth. I don't think it's a question of having capitalism or socialism, but our creating a relationship between them to enhance their strength while solving their weakness. I just discovered the term "mixed economy" and that sounds pretty damn cool. Nature doesn't ever choose between Ying and Yang, it's always balance. bullfrogma, I think what matters more than the relationship between capitalism and socialism is the foundation on which they sit. If the rules are made for people to be included in sharing the wealth they create, then people will prosper under either capitalism or socialism. If the rules are made for the wealth to flow to the elite, then people will be repressed under either. The Internet Party was recently launched in New Zealand. They're campaigning for better infrastructure to boost the economy and they have a very strong stance on the right to privacy. Compared to them, the After Party looks weak and blurry. Think of succession, and don't assume all people are going to be good or do the right thing. Time changes everything, and rules change because the times change, and we have to count on that propensity for adaptation. Socialism and capitalism are the rules, that is the foundation, and it's the difference between democracy and liberty. The rules are made for wealth to flow to the elite because we have way too much capitalism going on without any real democracy / socialism. But too much socialism throws individuality out the window, not to mention the tons of other problems it causes. Communism is certainly not the ultimate stage because it requires people to be of a like mind, backed by violence, such as prison. You're right that the rules change over time. However, capitalism and socialism are not the rules - they're platforms (frameworks?) which sit on top of the rules. The automotive and meat packing industries used to pay their workers well. They were capitalist sectors. Over time, the rules changed so that the money flowed to the executives rather than the workers. They're still capitalist sectors, but the rules for sharing money around (i.e. the distribution of rights) has changed. For now, the IT sector is a good place to work. Anyone can start a company and have a shot at making millions. Even if you work for someone else's company, you can become rich. This is capitalism in a relatively inclusive environment. In the agriculture sector, farmers are producing bigger yields than at any other time in history, yet they're going deeper and deeper into debt (unless they're getting sufficient subsidies). It's illegal in 13 states to criticise food which has been produced using certain methods (look up the food liable laws) because it may lead to a decrease in the profits of various parties in the supply chain. This is capitalism in an extractive environment. Capitalism isn't the problem - it's the rules which govern capitalism. This is why conservatives look at liberals as if they have two heads when they criticise capitalism - it worked for centuries before neoliberals shifted the rules to favour themselves. It worked BECAUSE America was the land of the free. That's no longer the case, which is why the economy behaves in an exploitative manner. The problem with too much liberty is that you end up with Might is Right, such as these neoliberals you speak of. Capitalism is always going to end in monopoly simply because Might is Right. It needs democracy, aka socialism, to restrain that freedom into a system that can work sustainably. bullfrogma, you're absolutely correct with what you say about too much liberty. That's the cause of many of the problems facing the West today - too many rights have been shifted towards the private sector. If too many rights belong to the public sector, then you have the kinds of problems that the Soviet Union had. What Buddha said about balance is correct. If the string of an instrument is too tight, the string will break. If it's too loose, it won't play. Prosperity is found in having a balance of rights. Monopolies can only exist if rights are unbalanced, whether it's in the direction of the public sector (such as government owned telecoms companies) or the private sector (such as banks who create money out of thin air). Nice, that string metaphor is good. I get pretty fed up with political language because all of it is so loaded, you never really know how someone's going to interpret it, like babel. So much labeling yet people are so varied. Historically, U.S. agriculture thrived under capitalism because people were given a share of the land (for free) and could enjoy the rewards of their own labour. I remember a commentary which was written by a British officer in the 1770's which said that Americans had yellow teeth because of the huge quantities of bread their women baked. Up until the 1750's, there was no unemployment in the colonies, even though they'd always been capitalist. It wasn't until the monetary system was reformed in 1751 and again in 1764 that hardship appeared because the power to create money was taken away from Americans and there wasn't enough currency in circulation to sustain the economy. Capitalism is not the problem. Democracy is absolutely not the problem. The rules which shape them have changed and have become a problem. flip, I did address what you said about the owner shipping off the lake, etc. That's CAPITALISM IN AN EXTRACTIVE ENVIRONMENT. In other words, the rules allow the vast majority of the wealth to flow to a narrow elite. In the mid-1800's, Australians discovered gold in the state of Victoria. The government at the time debated as to whether they should sell the rights to private enterprises or sell licenses to anyone who wanted to prospect for gold. They opted to allow the public share in the wealth and benefit from their own hard work rather than allow a corporate monopoly to direct the majority of the wealth to its owners. The population of the state tripled. That was CAPITALISM IN AN INCLUSIVE ENVIRONMENT. Apply that to your lake analogy. You are correct that the U.S. was not completely inclusive, yet it did offer more freedom than virtually anywhere else on Earth. Slavery was prevalent in the south, and it's no accident that the southern states are relatively poorer than their northern neighbours - they had an extractive environment which stifled innovation and the creation of free enterprise. As for Africans dying from easily preventable disease; that's another case of people living in an extractive environment. Colonialism did a great deal of harm by creating formal socio-economic structures which served the rulers at the expense of the people. When the Europeans left, those structures remained. They were able to extract wealth by setting up corporations which were supposed to benefit local producers, but were governed by rules which allowed them to take so much money out of the corporations that there was nothing left to benefit the community. You see, the problem is the rules and not the platform that sits on top of them. the rule is that I own the food or the water and can sell it to the highest bidder. now when you are starving what rule would you look to help you? I would look to a pitchfork - do you understand that reference? Do you own all of the food and all of the water in the area? If so, it sounds like the symptoms of an extractive environment, which is perfectly aligned with what I've been saying. In an inclusive environment, the rules would prevent you from being allowed to take complete ownership (antitrust laws) so that everyone else can have a fair shot at prosperity. like I said you can design rules that will make capitalism more fair - lets make a rule that everyone makes the same amount of money - good rule? ok so now 4 (or 8 or 10 or whatever) people or companies own the water - or oil or land on which to grow food and china will pay more for it. what rule does the population look to then. keep in mind that the rules say the ceo must maximize profit so he must sell the food to china and watch his fellow citizens starve. good rule, maximizing profit? There are laws to prevent certain products from being exported or from allowing foreign companies to take over domestic ones. I don't believe that price fixing or forcing everyone to have the same salary are good ideas. first of all I am a capitalist. I teach tennis and have had my own (very small) business for 40 years. I do agree that very strong laws could make capitalism work for most and i would be for that system. we can talk about the rules that should be put in place but it is a bit of a fantasy no? Sweden and Denmark are good models but still you have one man (or a few) making decisions on how and where to invest etc. we could make rules that would make the world look like adam smiths town of bakers and barbers and small shop keepers and I would be for that but how do you deal with ge or DuPont and big companies like that. workers ownership - now we are not capitalistic anymore - right? as to economic development - all of the developed countries used trade barriers to protect young industry - read economic history - I can probably get you some good info but no time now. just look at the u.s. - we were exporting furs and trees while britian had advanced textiles. we protected the early textile industry until they could complete with britians. as I said you can make laws that will gut capitalism - trade barriers we might call them. that is how the u.s. developed as did really all developed countries. but that is not true capitalism. when I own the food and the government tells me who I can and cannot sell I to not we have central planning. don't you listen to kudlow? as I said from the start a real grassroots capitalism with very tight government control would be much better than what we have but it has never happened. Volvo threatens to move its plants to Russia for lower wages. that is the world we live in. Ireland exports food to England during the famine - that is the real history of capitalism not your made up small farmers in new England - living in harmony with nature and the Indians. don't care what Ludwig and Milton say the history of capitalism is exploitation and extraction to the point of the destruction of local populations and nature. the system (capitalism that is) is a mess and will always be. Are you saying that the U.S. developed because of trade barriers? If so, I'm interested in hearing more. It sounds like you agree with me that laws can make capitalism work for the benefit of everyone and not just the elites. If you read what I've written earlier in other posts in this thread, I said that prosperity is found in balance. The laws should not be so strict as to prevent people from engaging in commerce and they should not be so loose as to allow them to do whatever they want and exploit people. You, like most other people, are so used to capitalism in an extractive environment that you think that capitalism is the root cause. However, if the laws can make it work better, then it isn't the root cause - the laws are. Right now capitalism is the problem because there is no democracy (a result from having too little before). Without that democracy capitalism is nothing but liberty, and because of that someone will definitely take over and create a self defending monopoly. Might will always be Right in that arena. Where will the after party after party be held? "Your party is over Wall St."--The After party. This is so good! Jump all over me for saying this if you want, but I have read nothing as powerful, as direct, as beautiful, and as fierce as the Manifesto and the Platform, since reading the preamble to the constitution. There is a beautiful clarity and wisdom in these words that have been written. Even if the "After Party" were to disappear tomorrow, what they/we(?) have written will live on. It will not disappear. Holy One, Holy Ones...may there come the day when the people will be able to look to a future, that is not one of all this darkness, but one where HOPE is dreamed again. Oh, Iconic Wall St., in all your myriad faces...your party IS over. The Party is Over! Hoka-Hey! Hey ZenDog...yes, there are and will be many things that need be done. Everyone should remember that no matter how important history is in our understanding of things...WE ARE NOT THE PRISONERS OF HISTORY! You're a daisy if you do..
Good to see you, Zen. 'If you run a mega bank, New York is a wonderful town - because for over a century, the Big Six banks and their leaders have dominated not just the U.S. banking industry, but American and global finance...' from - http://www.nationofchange.org/jp-morgan-jamie-dimon-1397396453 I do recall that you don't really like the 'NoC' but don't knock it DaisyDuke & read that piece pls. :) Never Give Up! Occupy Wall Street! How will decisions be made? Please don’t give me some crap about a leaderless dynamic. How was the decision made to create a party? How was the name chosen? How would I make my voice heard if I joined the AP? Exactly Jim! The After Party happens when all the bars are closed and it is time to get sober, wake up in every sense and work together, as opposed to drinking your sorrow individually, getting drunk and in debt. Please understand that words matter and choose wisely when you are naming something so important.